PGEs are the densest of the metallic elements, and they are highly durable. This, along with their high value because of their rarity, make them ideal candidates for recycling. The first known mining of platinum and palladium alloys is thought to have occurred in pre-Columbian South America (Colombia and Ecuador), where indigenous people mined them from stream sediments and shaped them into jewelry. According to the US Geological Survey (USGS), after 1500 the Spaniards, upon finding platinum grains mixed with gold nuggets in stream deposits, named the metal “platina” meaning “small silver”. However it was considered to be a worthless impurity. Platinum was named a new metal in 1750, followed by the rest of the PGE group, in the early 1800s. PGEs are among the rarest of elements in the Earth’s crust. The crust has just 0.0005 parts per million (ppm) platinum for example, compared to 60 million ppm copper and 0.075 Mppm silver and 0.004 Mppm gold. Over 100 minerals contain components of PGEs, but they are too small to see with the naked eye. Their presence must generally be confirmed by lab analysis. Most PGEs are concentrated in magmatic ore deposits, formed millions of years ago when magma flowed up from Earth’s mantle, cooled and crystallized. Through this process, PGE-rich sulfides accumulated to form PGE deposits. When PGE-enriched rocks eroded, through the movement of water, PGE-enriched placer deposits formed. The leading use of PGEs is in catalytic converters. These essential automobile components scrub tailpipe emissions in gas or diesel-fueled vehicles. Palladium is an ingredient in catalytic converters for gasoline-powered cars, vans and trucks; platinum is in the catalytic converters of diesel vehicles. Autocatalyst demand accounts for three-quarters of palladium demand. Twenty-five to 50% of palladium is routinely substituted for platinum in catalytic converters, due to its normally lower price. However that is now reversed, with the price of palladium about double that of platinum. If that dynamic stays the same, carmakers will substitute platinum for higher-priced palladium. I was surprised to read that, according to the International Platinum Group Metals Association (IPA), one-quarter of all manufactured goods either contain a PGE, or a PGE played a key role in its production. That makes PGEs indispensable for industrial applications. The chemical industry for example needs platinum or platinum-rhodium alloys to make specialty silicones and nitric oxide - the raw material in fertilizers, explosives and nitric acid. Platinum-supported catalysts are used to refine crude oil and to produce high-octane gasoline. They are also heavily applied in electronics, with PGE components utilized to increase storage capacities in computer hard disk drives, in multilayer ceramic capacitors, and hybridized integrated circuits. PGEs are needed to produce fiberglass, liquid-crystal and flat-panel displays. Platinum and iridium’s non-corrosive qualities make them ideal for medical implants such as pacemakers, and surgical tools. Palladium, platinum and rhodium are also investment metals, bought and sold as bars, coins or ETFs. An emerging market for platinum is in the manufacture of hydrogen fuel cells. Platinum is used to spur the chemical reaction of hydrogen with oxygen. Recognized as powering NASA’s 1969-72 moon landers, the process produces electricity and water. In the case of a fuel-cell electric vehicle, hydrogen is stored in a fuel tank before it is mixed with oxygen from the air. "Several thousand ounces of platinum are used annually and this will grow as the technology is rolled out, potentially exceeding 100,000 ounces per year in the late 2020s." Out of 69 million tonnes of PGEs found worldwide, South Africa’s Bushveld Complex has the largest reserves of platinum and palladium - 63 million tonnes as of 2018, according to the USGS. Russia and Zimbabwe are a respective second and third. The US Geological Survey notes that about 104,000 tonnes of PGEs could be developed throughout the world. South Africa is also far and away the largest Pt and Pd producer in the world, outputting 178,000 tonnes combined last year. Canada is a significant producer of PGEs, mining and processing 17,000 tonnes of palladium and 9,500 tonnes of platinum in 2018. Up until 1920, nearly all PGE production came from placer deposits in Russia and Colombia. PGE mining now takes place mostly in Siberia and South Africa. The United States is heavily dependent on external sources for PGEs, importing about 90% of the PGE metals it consumes. Platinum group metals were included among a 2018 list of 37 mineral commodities the United States considers critical to its economic security and national security. North America only has two producing platinum and palladium mines - Stillwater in Montana and North American Palladium’s Lac des Iles mine northwest of Thunder Bay, Ontario. Canadian PGEs are also recovered as a by-product of nickel mining, mostly from the Sudbury Basin, as well as northern Quebec and Manitoba. About three-quarters of Canadian PGE production is sold to the United States. The United States gets 31% of its palladium and 44% of its platinum from South Africa; Russia supplies 28% of US palladium needs. According to the US Geological Survey, the supply of PGEs from South Africa, the number one producer, is anything but guaranteed. Last year production there fell compared to 2017, owing to jobs cuts and mine shaft closures - a trend that is likely to continue. “Production was expected to continue decreasing as the world’s third-leading PGM-mining company, by production volume, announced plans to cut 13,000 jobs over the next two years at some of its mines in South Africa,” states USGS. Another key factor affecting supply: Platinum mining in South Africa is frequently interrupted by labour unrest. In 2014 workers at the country’s three major producers - Lonmin, Anglo American Platinum and Impala Platinum - downed tools for five months demanding that wages be doubled. The strike was the longest and most expensive in South African history, shutting down about 40% of the world’s platinum production. The industry was bracing for another shutdown this year but won a reprieve in February after a court reserved judgment on whether to block a scheduled week-long strike. Bloomberg reported the Minerals Council lobby group saying that producers could lose 1.3 tons of PGE production equal to $36 million, every day the workers stay off the job. Impala Platinum would be “devastated” by a labor disruption, its CEO said in a statement, as it tries to restructure its Rustenburg operations to stem losses. The country’s platinum miners are under constant pressure to contain costs, because their mines are some of the deepest and most labor-intensive in the world. High temperatures are also a serious issue. Platinum is being mined in reefs up to two kilometers deep, where virgin rock temperatures have been measured at 70 degrees C. Anglo American considers 75 degrees to be the limit for mining, taking into account the metals prices, energy costs and available technology needed in such an operating environment. There are significant infrastructure constraints, too. The country has limited processing capacity and water is a constant concern. Last summer Cape Town came dangerously close to running out of water and was only saved from “Day Zero” by stringent restrictions on water usage. In early 2018 officials in Cape Town warned that unless drastic conservation measures were taken, by summer the city’s 4 million residents would be forced to cue up for drinking water surrounded by armed guards. “Day Zero”, when taps would be turned off due to perilously low reservoir levels, was originally predicted for July 2018 but has now been pushed back to 2019. Power in South Africa is notoriously unreliable - blackouts are frequent. In 2008 the country’s electricity grid nearly collapsed due to a shortage of coal for power stations and system faults. Eskom, the main utility, ordered all mining operations to evacuate underground staff and to stop mining for five days, then cut electricity supply across South Africa to minimum levels; the mining industry uses about 15% of Eskom’s output. The stoppage, affecting roughly a quarter of generating capacity, cost the industry billions in lost output. In February, Reuters reported that Eskom imposed the worst power cuts in years on homes and businesses, as the utility grappled with another crisis within its crumbling power infrastructure. While the prices of platinum, palladium and rhodium have all gained in recent months (platinum has risen 13.7% since the beginning of February, to $886.80/oz) thus helping the bottom lines of South African producers, Anglo American Platinum’s CEO has gone on record as saying that doesn’t mean the industry will boost supply. CEO Chris Griffith told Bloomberg it takes between five and seven years to open a new mine, and while some expansions are underway (like Rustenburg), the increased output is likely to just replace supply declines elsewhere; the end result will be a flat supply curve over the next decade. 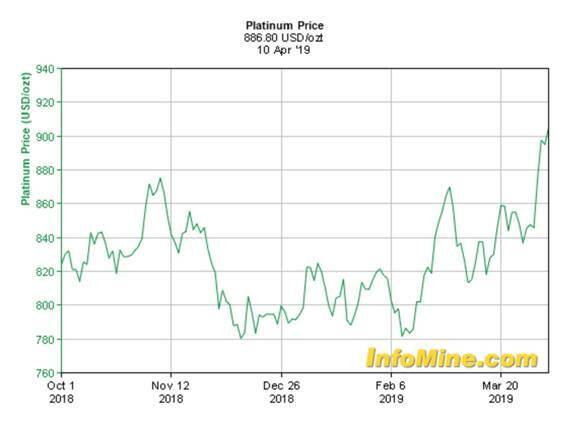 The platinum market is currently oversupplied, with prices trailing both gold and palladium. In January the precious metal dropped to a near 14-year low. According to a recent report from the World Platinum Investment Council, the market is predicted to move further into surplus this year, to 680,000 ounces compared to the 645,000-ounce surplus in 2018. The main problem is mined supply outstripping consumption. Platinum is flowing into the market from mine stockpiles and smelters in South Africa, that accumulated during upgrades and maintenance over 2017 and 2018, states WPIC. US platinum production is expected to expand eight-fold, from 50,000 ounces to 210,000 oz. However, the precious metal that is a popular material for jewelry, has fought back since the beginning of February, rising from $780 an ounce to $886.80/oz as of April 10 - a gain of 13.7%. Discovered by William Wollaston in 1803, palladium was named after the asteroid ‘Pallas’. Demand for the metallic element has surged since 2016 with the movement away from more polluting diesel-fueled vehicles. The price has more than doubled over the last three years (+124%) and ran up 18% in 2018. That compares to declines in spot gold, platinum and silver last year. As drivers shift from diesel to gas-powered cars or hybrids, the market for palladium used in gasoline engines has buoyed the price. In 2017 palladium raced past $1,700 an ounce for the first time since 2001. Despite automobile demand slumping in China last year, palladium finished 2018 at $1,262 an ounce - almost catching gold’s year-end close of $1,282/oz. The increasing use of palladium in hybrid vehicles deserves more fleshing out. An executive at Russian nickel and palladium miner Norilsk Nickel PJSC said recently that the combined use of palladium in hybrid and plug-in hybrid/rechargeable vehicles is set to triple this year compared to 2016. A 2018 report by JP Morgan Chase & Co. predicts hybrids are expected to grow from 3% of global marketshare to 23% by 2025. Like platinum, palladium is facing constricted supply. According to a report from Sprott Asset Management, “Supply shortages continue to support palladium’s performance, with strong multi-year growth in palladium demand now straining a fixed supply.” The Sprott report also notes that supply for palladium is inelastic because it’s usually a by-product of other ores like platinum and rhodium. South African palladium is a by-product of platinum mining and palladium from Russia is a by-product of nickel. Between them, the two countries control almost 90% of the palladium market. 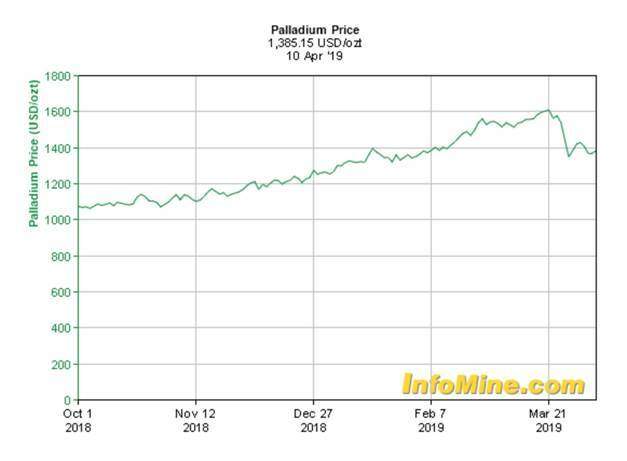 On March 19, 2019, palladium prices rocketed past $1,600 an ounce, the market’s reaction to news that top producer Russia is considering banning the export of precious metals scrap, refining it domestically instead. That was on top of an announcement that Fiat Chrysler has been ordered to recall almost a million vehicles over failed emissions testing. 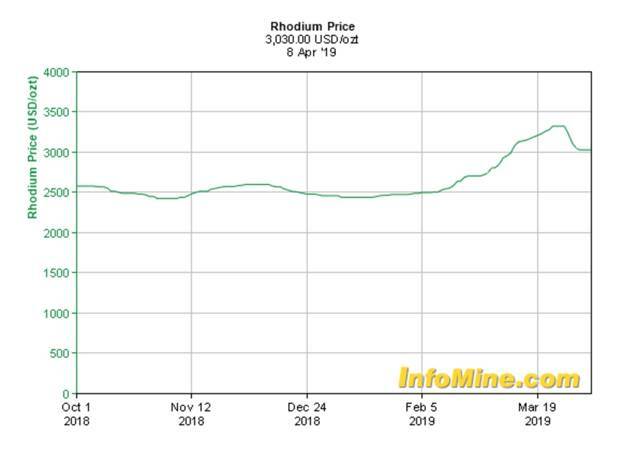 In conjunction with that recall, prices for rhodium, which also go into catalytic converters, traded above $3,000 an ounce in March, MINING.com reported. The recall is expected to strip out 25,000 ounces of rhodium demand. Platinum group metals are extremely advantageous for exploration or mining companies to have in their deposits because PGEs provide a “kick” to lower-value base metals. Consider for example a VMS deposit that is rich in copper and zinc, but also has platinum and palladium by-products. When base metals prices are up, those PGEs are a nice extra to have, and if copper and zinc prices slump, that miner will be thankful for the PGEs, whose prices normally rise when base metals fall. PGEs also fit in with the electrification trend I continue to follow and invest in. Palladium, platinum and rhodium are not only used in catalytic converters required for diesel/gas-powered vehicles, but cleaner and greener hybrids. Platinum also has an emerging use in fuel-cell vehicles. I like PGEs because they’re rare, and the market is in no danger of oversupply. The leading platinum producers are saying there’s no way we’re looking at a glut anytime soon, for all the above-mentioned factors: labor disruptions at South African platinum mines, power outages, expansion problems due to constrained water supplies and processing capacity, not to mention the fact that platinum mining is difficult and expensive - it’s not easy to increase production even if prices rise considerably. And it takes five to seven years to open a new mine. We also need to emphasize that PGEs are critical metals. A relatively small amount is mined in the US and Canada - the most friendly country to the United States in the event of a supply disruption. Who are the alternatives? Russia, Zimbabwe and South Africa. Russia is the target of US sanctions and a constant thorn in its side, Zimbabwe has a basket-case economy, and South Africa can’t be counted on for a reliable supply of PGEs, due to the factors I’ve outlined. For all these reasons I have PGEs and PGE explorers on my radar screen. At Ahead of the Herd we know investable, palladium pure play juniors are as scarce as the metal itself. Stay tuned, we’ll be rolling out our top choice very soon.